In today’s world, does marketing equal Social Media? 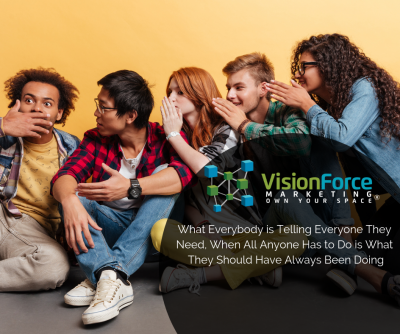 It is a popular subject at networking events and industry conferences; everybody seems to want it because they’re being told by everyone that they need it. So, what exactly is this most common of topics which have become so ridiculously over-exposed? Social Media; and everyone is an expert . . . just ask them. My well-read readers already know this of course, but the rest of the world is fast forgetting that Social Media is only a piece of what Marketing truly is. Ten years ago a large corporation would not stop their marketing efforts at printing business cards. A small business owner would not have gone to one networking event and decided that was enough to sustain business. Marketing is not a singular object, and more importantly, it is not only a noun, but it is also a verb. Verbs are by very definition a form of action. Companies have always met their customers where they are, this isn’t anything new; in fact, it is the key to Marketing. Some companies budget for printed materials like catalogs, brochures, and postcards, while others allocate resources to press releases, advertising, and white papers. Smaller companies rely heavily on their networks, word of mouth and referrals. What’s Your Social Media Saying? The onslaught of Social Media and the ensuing entourage of experts has created two decidedly polar opposite camps of thought on the subject – those who are mesmerized by all things social and those who drip with a palpable disdain for anything which requires any type on-line dialogue. Two things concern me, the first of which is those who dismiss social media seem to correlate it with Marketing in general. The second oddity is those who are hyper-focused on Social Media forget that it’s only a small piece of the puzzle and talk about it like there is no other possible way to do business. So, what used to be another respectable department has now been sliced, diced and minced into an unrecognizable dish of mushy marketing. I’m not quite sure when this shift happened. I was shielded by a corporation during the birth of Social Media and I only came out of that shelter recently. The demise of sound marketing can’t be blamed on corporate giants, the economy or the political landscape. I think it’s a direct result of the gazillions of people who are convinced they too can do Marketing because they interact with their friends on Facebook and Twitter. Everyone has become an expert in Social Media and therefore, by default, they think they’re experts in Marketing. I’ve met many smart businessmen and women who are frustrated and fed up with the hype about Social Media. Over the last few months, I’ve become increasingly aware of how few people out there are even willing to help these people make sense of it all. I understand we all get distracted by the shiny objects from time to time, but at some point, we have to refocus. Social Media is nothing more than a different type of platform in which to network, connect, communicate and engage customers. The question remains – why has it taken over and usurped every other Marketing tactic out there? When did having a Marketing Plan become such a novel idea? Did the rest of the world lose sight of what Marketing is while I was scurrying around in a corporate environment? Has it only been within the confines of corporate America where a Marketing Plan is pounded out alongside the budget, product gap analysis, and the notorious PowerPoint 4-block? I’ve met so many people resistant to Marketing because of a false connotation of what Marketing is, what it means and what it can do for them. Allow me to bring us down out of the ubiquitous “cloud” for a moment. Marketing, in its truest sense, is developing such a deep knowledge of the industry (or market) that one is able to see trends and identify customer needs before the customer even knows that they need it. That depth of knowledge yields a keen sense of intuition and anticipation which allows one to get to the root of what an end-user will want before they even know they will want it. This kind of Thought Leadership creates trends – it does not follow them. This is why Marketing in its purest form drives revenue and increases profits. Research after research shows that market-driven companies who understand this concept ultimately succeed. Those who dare to delve into customer trends and those who figure out when to expand, redirect or even exit those trends – those are the companies who are most successful. That is what fantastic Marketing actually does . . . and that is precisely what professional Marketers do. How To Help Your Business If Your Struggling With A Social Media Strategy? What I’m seeing now is a disproportionate number of businesses struggling to make sense of Social Media, when all they really need to do is get back to what they used to do, before Social Media exploded. Sure, LinkedIn might replace the old announcement and Google My Business might replace your newsletter, but this is no different from when the Fax machine came onto the scene. The information being transmitted wasn’t different, only the platform in which the information was transmitted changed. The information you provide to your customers isn’t any different from what you would have shared with them 5 years ago, it’s just on a different platform. It’s that simple. It is not appropriate for every company to have a Facebook page or a Twitter account; while admittedly for others, it can be their primary contact with customers. The point is, it is as individual as the company itself. There is no reason to be overwhelmed, there is no reason to think you’re not smart enough to figure it out. It isn’t rocket science – it’s Marketing. Just like any other profession, it is a discipline and there are people who can help you make sense out of it. Stop listening to every “Social Media Expert” out there and get back to the basics. Find out where your customers are, and for goodness sake, if you haven’t already – write a Marketing Plan so you don’t waste your valuable resources chasing shiny objects.